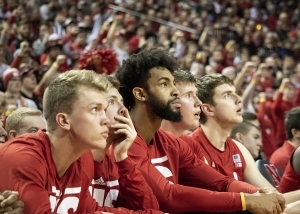 There were some silver linings for the Huskers in their loss to the Badgers on Tuesday. Thorir Thorbjarnarson was a revelation, pulling down 10 rebounds in 17 minutes. Isaiah Roby looked unstoppable at times, at one point looking like he was going to rip the rim off on a two handed slam in the first half. The Huskers also rallied back in the second half to take the lead after trailing by a 14 point deficit in the first. (Photo – Kenny Larabee) Wisconsin forward Ethan Happ puts up a basket while Nebraska forward Isaiah Roby defends in the second half of Nebraska’s 62-51 loss to Wisconsin Tuesday night. 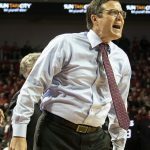 But make no mistake about it, the Nebraska basketball team is in a bit of a freefall right now, having lost four straight games. Nebraska only received three points from their bench. The lack of bench production is especially damage since Nebraska is without starting forward Isaac Copeland, who was averaging 14 points per game before he went down with a season ending knee injury. 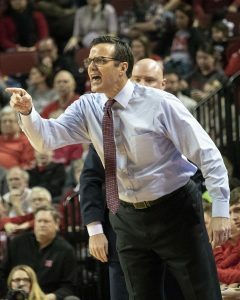 “We’ve got guys in different positions who haven’t practiced very much,” Husker head coach Tim Miles said. 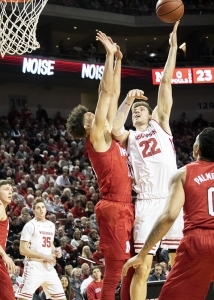 The Huskers also shot a paltry 9-21 at the rim, severely inhibiting their offense. However, with 10 league games left, Miles remains hopeful that his team can put together a run. On Saturday, the Huskers will be looking to snap their losing streak, as they get set to take on Illinois. The last time the two teams met was earlier this season, back at PBA on December 2nd. Nebraska won that game handily, 75 to 60. The Illini are only 6-15 on the season, but are coming off of a win against a nationally ranked Maryland team on a neutral floor. Tip-off is set for 1:15 on Saturday. 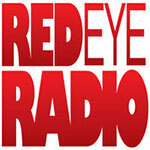 Pregame coverage will begin at 12:15 on 1400, KLIN.